I've definitely got some learning to do, but Mendel did a great job! The first day we had fun, but didn't win anything. I made a few mistakes and the slippery floor scared the beejezus out of me, but we still had lots of fun. We were SO happy that our Minnesota friends came to the show! We went to their hotel to play and visit for a while on Saturday. Oh, well, the show must go on! Mendel showed his big fluffy tail off for me, and it paid off! 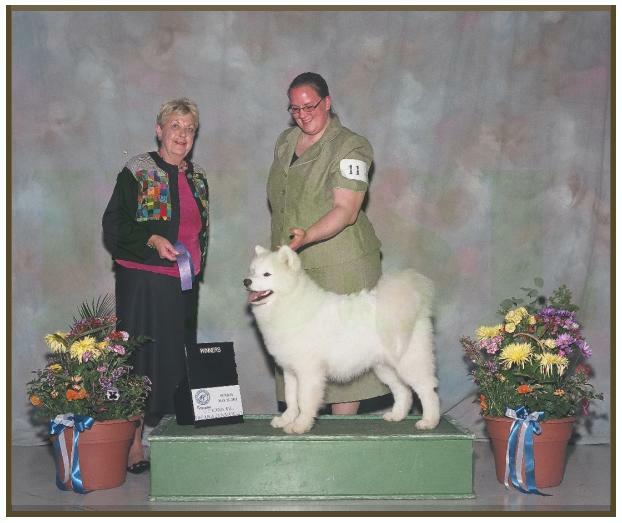 He earned himself a point by going Winners Dog under judge Diane Anderson. While getting our picture taken with the judge she told me she just loved him. I'm pretty sure I'll never get tired of hearing that. :) I'm ecstatic about the point, especially in his first show, but I'm even more happy about how completely awesome he was. He was happy, bouncy, did everything I asked of him with a big smile on his face and we had FUN! I get the distinct feeling he knows when the game is on - he generally stacks himself pretty nicely for me at home, but he's always better in a ring (either at class, or at the show).